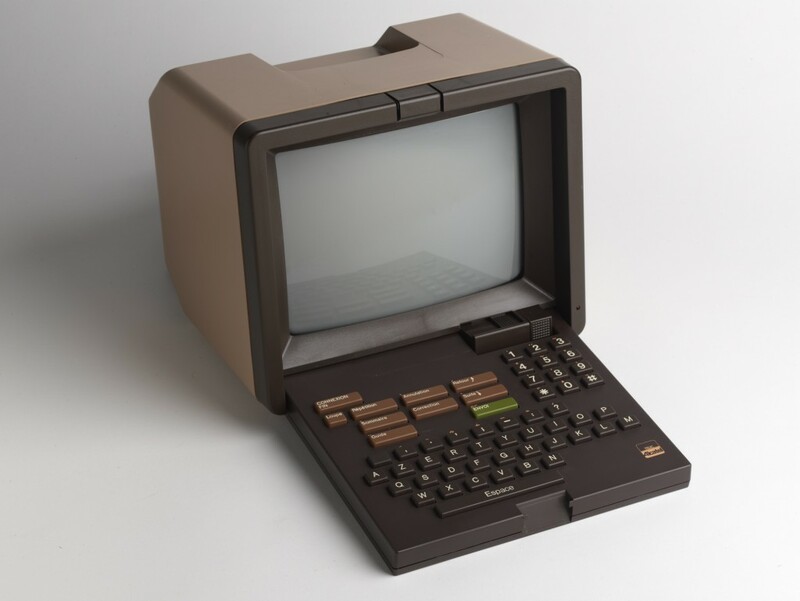 The Minitel (from the French Médium Interactif par Numérisation d'Information Téléphonique) was an interactive videotex online service accessible through phone lines, operated in France from 1982 by the state-owned PTT (Postes, Télégraphes et Téléphones), the ancestor of France Télécom. The service was retired in 2012, after more than 30 years of existence. It might have been the world's most successful early online service, before the World Wide Web era. It offered services like telephone directory, purchases, reservations, mail, and chat just like the Web offers today. The first version of the Minitel, made by Telic Alcatel. So 80s. Before starting to tinker, it's interesting to recall that the story behind the Minitel is actually pretty tragic despite its success. In the 70s, France was leading research on packet-switched networks. The CYCLADES project, directed by Louis Pouzin, inventor of the datagram, designed an early datagram-based packet communications network. In parallel, the French PTT was developing Transpac, a packet network based on virtual circuit switching with the emerging X.25 standard, which would be used by the Télétel network of the Minitel. The debate between datagrams and virtual circuits was eventually cut short by bureaucratic decisions in favor of the PTT. Datagram-based projects were stopped, but Pouzin's work on datagram networks served as an inspiration for academics like Leonard Kleinrock, Robert Kahn and Vinton Cerf in the development of ARPANET, the ancestor of the Internet, at UCLA, California. In the following years, France Télécom, backed by the French administration, enforced monopolistic prices and wanted to stick to a state-owned centralized circuit-switched network. They tried to resist the emerging Internet, maintaining it was only a flash in the pan. You know the rest. Back to our terminal: several tutorials already exist on the Web, but most of them use a COM port, which is becoming rather uncommon, and expect a Linux distribution with System V init, which is now deprecated in most distributions in favor of Systemd. I'm using a Minitel 1B, but every Minitel with a Fnct key should serve the purpose as well (so the Minitel 1 is not compatible with this setup). 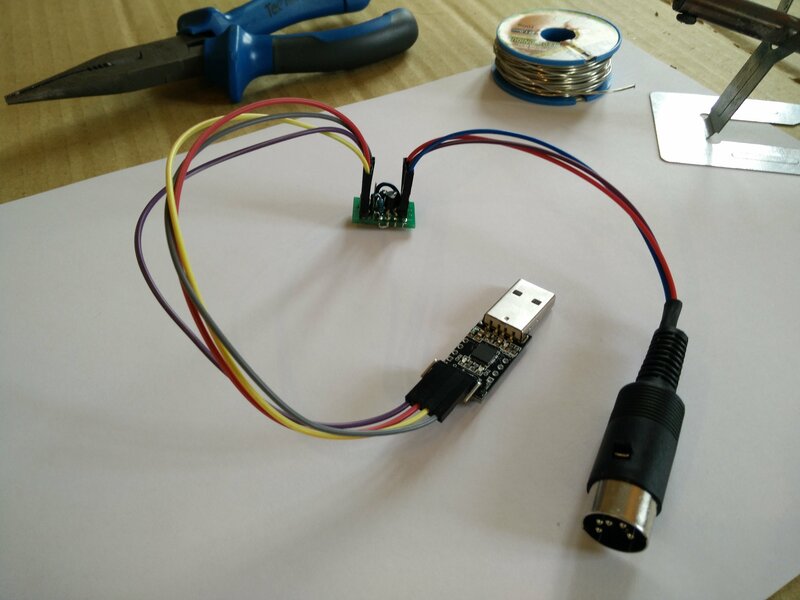 We will use a CP2102 USB to UART bridge so we can connect the Minitel via USB, as suggested on Pila's blog. The Minitel has a DIN socket with 5 pins on the back to use it in VT100 mode. The TX pin of the Minitel is connected directly to the RX pin of the UART with a 220 kΩ pull-up resistor to the 5V VCC. The RX pin of the Minitel might output a voltage up to 15V, so we need to adapt the level to 3.3V with a 2N2222A transistor and a voltage divider. Now that the hardware is ready, let's do some software configuration. First, we need a dedicated terminfo file so it works smoothly: mntl.ti written by Alexandre Montaron. 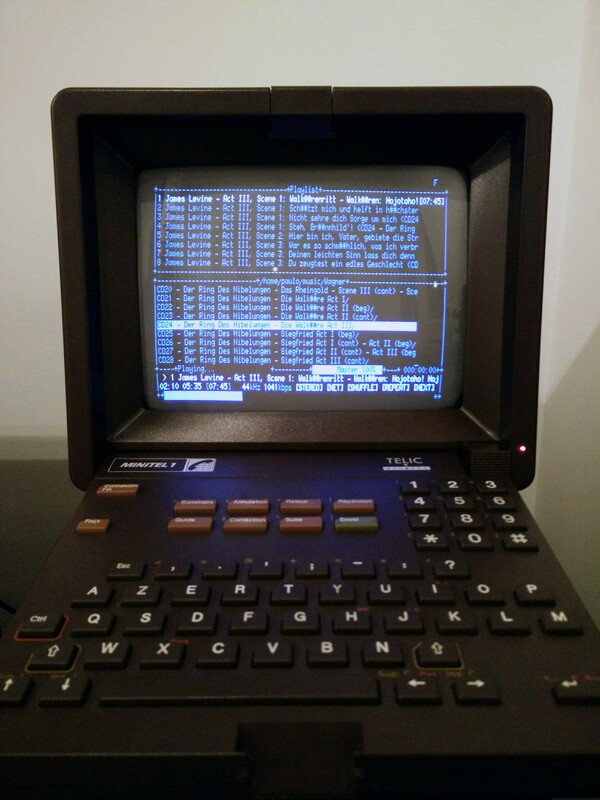 The Minitel requires specific escape codes for accents, so if you want them to work, the trick is to use screen with some termcapinfo commands added to ~/.screenrc, as specified in the mntl.ti file. 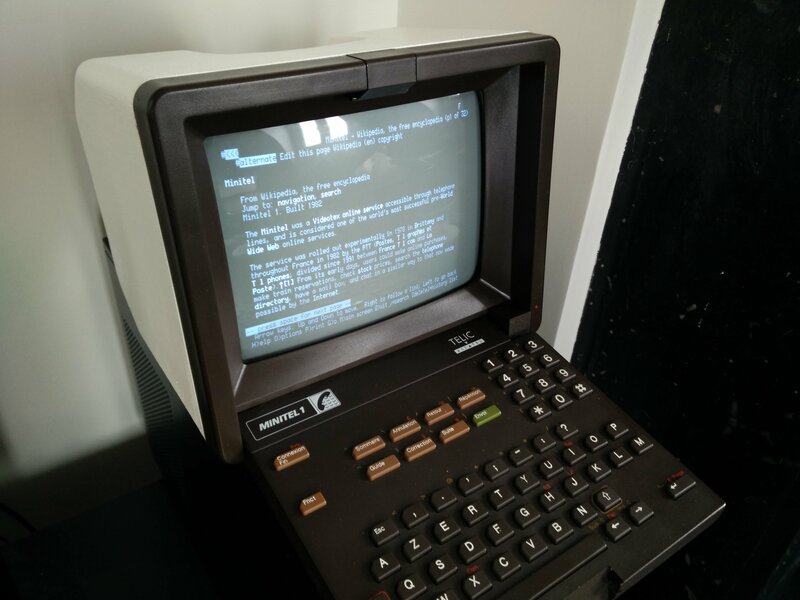 Eventually, let's send a prompt to the Minitel with agetty. Calling agetty directly is possible, except the login prompt is ugly. The reason for this issue is that the Minitel actually expects 7 bits with one even parity bit, and this has to be autodetected, but only after the login is sent. Therefore, we first issue a stty to set the terminal flags properly, then call agetty with the -c argument so it does not reset them. I'm setting the TERM environment variable to m1b-x80 for model 1B in 80-column mode. The purpose of the init string "\033\143" is to clear the screen before sending the prompt. It works perfectly, and most Linux console-based programs work without any issue on this old-fashioned terminal. For instance, Lynx works like a charm. Music on Console (MOC) also runs flawlessly, turning the Minitel into a nice retro music player interface!